There is another answer; create Men that are super geniuses from the past, who it is claimed existed 2,000 years ago (Atheism vs Theism), and who claim that every light source seen in the distance are in fact Spaceballs, illuminated by the Sun in a Heliocentric universe; and all these claims can be proof for future geniuses, "without ever proving it". Just like "satellite images" are proof of satellites, without proving the existence of satellites. A house of magical floating cards, with no foundation. My friend , check this on youtube . Anyone who has knowledge about "Struve Geodetic Arc"
Cannot find out how they messured it, only that the messuring and math was huge and complex. At first i thought it only was a meridian check of some sort but it turns out that the result of this actually supports Isaac Newtons theory that the earth is not perfectly round. If anyone has something on this please share with me. This has been inscribed in UNESCO World Heritage Site and we all know who the ppl behind UNESCO is! btw Newton was right, earth is not perfectly round, its perfeclty flat. Well i will continue to investigate this, keep up the good work guys. What are the crater like indentions on the face of the moon? I've been taking pictures of the moon with my P900 Nikon Cool Pix camera and the craters are quite obvious. I also noticed when I took pictures at night and then again several hours later the moon face seemed to have rotated much like a record would on a record player. I found this to be interesting and was curious as to anyone noticing this? I haven't seen very much information about that. Danno25 wrote: I've been taking pictures of the moon with my P900 Nikon Cool Pix camera and the craters are quite obvious. I also noticed when I took pictures at night and then again several hours later the moon face seemed to have rotated much like a record would on a record player. I found this to be interesting and was curious as to anyone noticing this? I haven't seen very much information about that. There is a topic dedicated to the moon which discusses this, I'd suggest jumping over and posting your pictures along with your location if possible so the data can be included in our catalog. Why doesn't the moon get closer to earth? This is my first time on here, so please take it easy on me. So, the other day I was watching the ISS EVA and one of the astronauts dropped something and I asked what would happen to the object? Someone explained it would spin round the earth and get pulled closer and closer over time. They then said the ISS would get pulled into earth if it wasn't adjusted with thrusters regularly. So if this is true due to gravity (which I don't believe btw) then how come the moon hasn't been pulled closer to earth over all these years? Apologies if this has already been asked. There is No Gravity, No Space, No Spaceballs, No Men in Space, and No ISS in Space. These are all man-made constructs called Science Fiction; the Space Enterprise. Please take time to read this forum, educate yourself to the fairy tale nonsense you watch and believe to be true. If you have any further questions make sure they are abou flat Earth, and not based on the fictional realm of Scientism. I absolutely agree, it was kind of my point. If gravity existed then surely the moon would have collided with the earth years ago. So that in itself is proof that gravity is made up. I am a new user and I have a question related to time zones. I am fairly familiar with the flat arth model and I accepted the explanation for time zone ( The sun being smaller/closer thus illuminatin only a portion of the flat earth). Now my first question is should we assume that the sun send down a cone shaped ray of light, or is it omnidirectionnal, or is it rather a flat disk only illuminating under it (in a cylindrical shape as opposed to a cone shaped one). It seem most plausible to me that it should be considered as a cone shape, althought I do not have proof... Now if it is cone shaped, as it is in most flat earth youtube videos, I can understand how sunrise and sunset works. The problem I am facing is that you can explain them seperately, but if you put them together it becomes contradictory. For example I am in Quebec wich is EST. New york and Santo domingo are as well. Now this seems more logical on a flat earth model since they are not a "straight line" on a globe earth, and even if they are not (a straight line) on a flat earth it is perfectly explained by the fact that the light from the sun has a cone shaped ray thus making a cricular light cast on the flat eath (viewed form atop). In other words It is sunrise in quebec and santo domingo at the same time because Quebec is nearer to the top of the conic/circular light cast by the sun, while santo domingo is closer to the middle or the bulge of the circle. Up to this point everything makes sense to me. The same phenomena happens at sunset. Except it is not that simple; in theory you can say that if you explained sunrise you have automatically aslo explained sunset but that is an assumption. Bear with me. So if EST works because of the curve/bulge of the cone shaped light that is going fom qubec to santo domingo, would sunset not be extremely problematic seeing that the curve of the light is in the opposite direction? 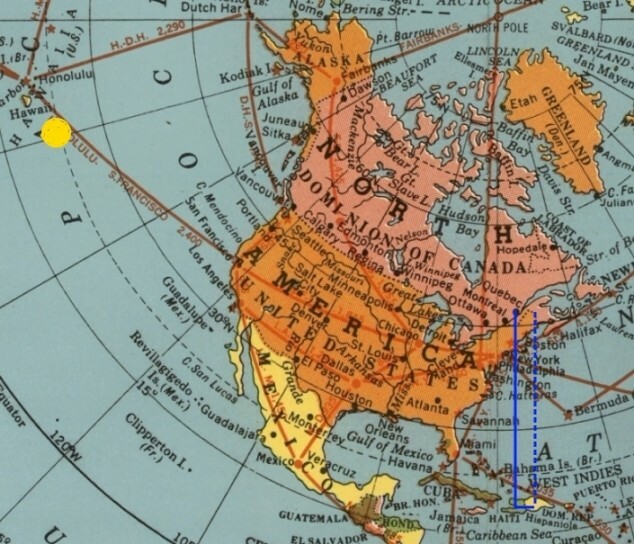 To paraphrase is the sunrise line is quebec to santo domingo it is curved left (when viewing the Americas on the bottom part of flat earth) but when sunset comes the line will be curved right thus causing great time discrepencies. Am I missing something from the flat earth model? Are the discrepencies accounted for? Earthskeptik wrote: Up to this point everything makes sense to me. Thanks for the info but my question was more about the latter part of my statement, about sunrise being a cricle to one side and sunset necessarely being a cricle on the opposite (both sides of the same circle if you will). If sunrise is about equal in quebec and san domingo shouldn't sunset be much later in san domingo that quebec since the phenomenon is hapenning inversely? Maybe I'm not being clear or I'm looking at this whorng? The Sun moves in an arc above the flat Earth, it's "area of influence" will be seen longer as it moves deeper along it's path, still illuminating the Northern Regions. Don't be so quick to accept that which we cannot prove ourselves. The AE map may not be 100% correct. There may not be an ice wall completely surrounding us. Two things we can be certain of, the earth doesn't spin, and curvature of land and oceans doesn't exist either. It is important that we don't make absolute claims which we cannot prove. The supposed curvature and motion of earth can be verifiably proven to not exist. Proving what all the continents look like and how much land there really is.....that is a whole different story. Hi there. I'm new here so please don't ban me if this isn't the right place to ask. I believe in the flat earth model but there are some questions which I can't figure out and I can't really find an answer for. These questions sometimes come up when I'm debating with a globe earther and I have a difficult time answering them Maybe some more knowledgeable people on here could help me out. - How do flat earthers explain the tides? - When viewed from the Northern Hemisphere the stars appear to rotate in a counter-clockwise direction around a point directly above the North Pole, yet when viewed from the Southern Hemisphere the stars appear to rotate in a clockwise direction around a point directly above the South Pole. Why? - Why does the moon appear upside-down in the northern hemisphere compared to the southern hemisphere? And on its side at the equator? - Why does the south pole experience several days without the sun rising (polar-night) during winter and several days of total daylight without the sun setting beneath the horizon during summer (polar-day)? - Why from the equator do the stars directly overhead appear to travel in a straight line while stars to the North or South appear to travel in curved paths? - How do you explain the Aurora Borealis and Aurora Australis? - What about the Cavendish experiment? I have a tough time understanding and refuting it. MrBobSapp wrote: Hi there. I'm new here so please don't ban me if this isn't the right place to ask. I believe in the flat earth model but there are some questions which I can't figure out and I can't really find an answer for. These questions sometimes come up when I'm debating with a globe earther and I have a difficult time answering them Maybe some more knowledgeable people on here could help me out. Have you observed this or do you have the source? The explanation now is that it is sunwinds how does that make any sense? What it is could be several things probably to do with electromagnetism, but I am not sure. I would answer this with some simple observation: how come so called gravity doesn't crush us while holding the oceans in. Or how come gravity is selective in what it attracts? I appreciate the answers but I was hoping for something a little more concrete. It seems there is still a lot of speculation here. What about the prolonged days of total darkness (polar night)? As for sources, I don't have sources, these are what people I debate with often ask me and I don't have the answers for. Thanks. hmm sorry i cant be of more help, but if i can give you some advice is to do your own experiments and observations and not ask for others to provide it for you. The one with the direction your standing maybe it helps if you illustrate that for yourself and proof to yourself one way or the other how it works. Get a disc then make the sun and the moon and make puppets that view it from different angles and you might be surprised how simple most answers can be. About the polar night, there is no south pole they just planted a flag and put that on film. There is no movies of it is there? It's all about perspective and location. If you are observing the moon from the north and see it it's features orientated one way, then it's simple to understand that someone viewing from the south will see it orientated another way - this is no way a validation for a ball earth. It's the same deal with the stars, we only see a certain portion of the nights sky with our limited vision - apply perspective and angular resolution then what we see becomes much easier to understand. There is an excellent video Rory from My Perspective did on this, it's posted somewhere on the forum. In regards to 24 hour sun light in the south - the establishment has only provided one video as evidence (https://www.youtube.com/watch?v=Zc-WlTaG7WY). However this video can easily be debunked as it contains CGI text that appears from behind mountains in the background, you can also easily see the sun looks nothing like what we observe in reality - thus one can deduce the entire scene is likely CGI. In future, I suggest if someone says "what about X", then ask them for empirical evidence of "X" before debating. Most of the ball earth zealots will hide behind THEORY or MANUFACTURED EVIDENCE (CGI). At IFERS, we take a scientific approach, we are not afraid to say we don't have all the answers.. unlike the followers of the big bang bible. I am new here and I have heard, read, and seen multiple theories on flat Earth and one that catches my eye is that there is a glass dome over our flat Earth. Is this correct? Also if anyone in here can help clarify for me, do flat Earthers also believe the Earth was created by God or aliens? A dome is not fact, generally this idea comes from those promoting the Bible as truth. We do not have any direct evidence of a physical dome, so one can only speculate on this topic. I personally believe that the dome idea came from the celestial sphere (the stars mapped on a sphere based on observations with the human eye), which was then mangled into the ball earth idea centuries later. In regards to creation, yes I believe most people here agree that the complexity of the world we live in cannot have come about from just random happenstance. But again, we cannot make claims without evidence so most discussion on this topic is also speculative. Gods and aliens from the books written by men are very far from the truth, I would hazard to guess. Thank you for those answers. I am inclined then to believe people that are flat Earthers will believe in either God or some Immaculate design. I am not promoting either way but the idea of our "Rogue" planet being designed opposite of everything viewed in our galaxy would give a special design in a way. On top of everything I am looking for evidence on the web pertaining to this theory and there doesn't seem to be any that I can find. I grew up believing the Earth is round and am inclined to still believe it due to there not being any solid evidence and that this would possibly be the largest and most in depth conspiracy in the history of man. It would mean that the three countries; Russia, USA, and China are coordinating this conspiracy along with the 22 other countries who have sent an astronaut along with Russia, US, or China on a trip to space. But then that would be if you believe we have never been to space, and then the unfathomable number of dollars spent globally on perpetuating a lie for as long as they have. But what is the point of making up this lie and spending so much money on covering up something that has no significance in being proven one way or another? "Person Of Logic"; this Person (see fiction) claims to live on a spinning ball that holds water about it's circumference. Please tell us how you replicate water that clings to spinning ball? Show me some Logic, but please do not use your religious indoctrination to answer questions you've invented. NASA is making money, not "spending money." They take 50 million dollars PER DAY from the American taxpayers and provide us nothing but lies, CGI and Hollywood trickery. The world is a stage, and if you believe Russia, USA, and China are not "playing ball," you have fallen for their WWE script. If you cannot fathom the motive and significance for this conspiracy, you should be reading, not writing, in this forum, because this is a research society with voluminous evidence compiled proving beyond any shadow of a doubt that you are not living on a tilting, wobbling, spinning sphere-pear. I recommend you start with 200 Proofs Earth is Not a Spinning Ball and show some due diligence in researching this topic before asking us to hold your hand through questions that already have entire threads devoted to answering them.